Despite its detractors, the number of licenses sold for Windows 8 are comparable to those for Windows 7. When Windows 8 was first announced, with a touchscreen-geared interface reminiscent of smartphones, many were fairly skeptical of its prospects. Today, if you Google search "most hated Windows OS", you'll see a long list of Windows 8 criticisms, including a few from prominent game developers. Before we write Windows 8 off entirely however, it's worth noting that the operating system is actually doing okay. Despite lower overall average sales compared to its predecessor, Microsoft revealed that Windows 8 sold 100 million licenses in its first six months alone. While 100 million is certainly a landmark achievement, that doesn't mean everything's coming up Microsoft. 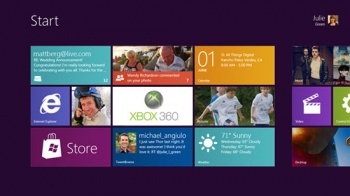 The bulk of Windows 8 sales, roughly 60 million copies, occurred during its first two months. That means sales dropped to 40 million from January to May, which isn't a good sign for Windows 8's long-term prospects. That said, the more popular Windows 7 also achieved 100 million in the same timeframe, and went on to boast 240 by its first year. The question is whether Microsoft can turn those decreasing sales around in time. "Is it perfect? No," says Microsoft Windows unit co-head Tami Reller. "Are there things we need to change? Absolutely. We are being very real about what needs to change and changing it as thoughtfully and quickly as we can." More specifically, Reller notes that Microsoft is adjusting Windows 8's learning curve for traditional customers, and will make the platform more usable across various devices. Considering how competitive the market has become since Windows 7, achieving 240 million sales by October is a pretty daunting benchmark for Microsoft. Still, 100 million is a great starting point, given the criticisms, and could increase further following the upcoming Windows Blue upgrade.